Big News! 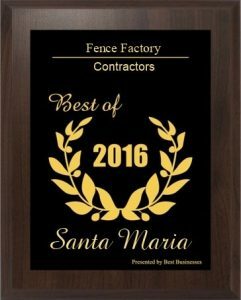 Fence Factory has just been awarded, not one, but two Small Business Excellence Award for two of our locations, Ventura and Santa Maria! These two locations were recognized for their excellence in achieving success and providing the local communities with long-term value. The Small Business Excellence Awards highlight over 45 years of success in providing quality fencing materials sales and installation for businesses and homes around the area. A variety of sources from internal and third-party data helped determine the results to the Small Business Awards. Every year, a selection committee identifies potential businesses that have been successful in their mission and continue to make a positive impact. We are excited to be recognized for our leadership and contributions to the local Ventura and Santa Maria areas. Thank you to all of our loyal customers and friends who have supported us, we hope to see you again soon!